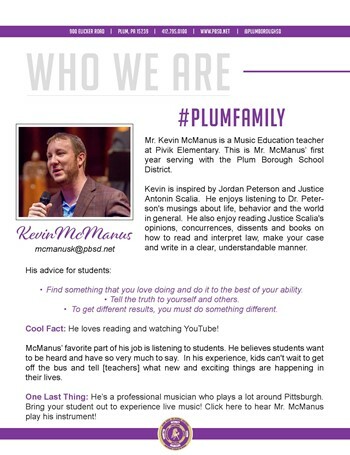 The Plum Borough School District is proud to share with you our latest interactive installment for PlumIS, our District newsletter. Take a peek inside and click around to see what we excitedly created just for you! PlumIS - April 2019 Release! 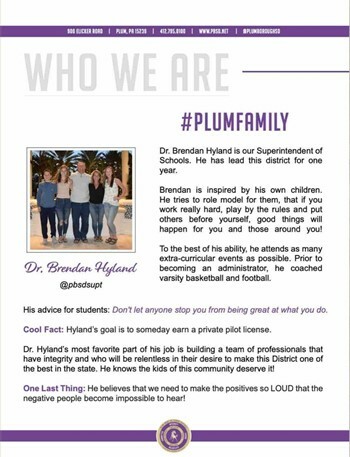 Click the hyperlinks below to view the newly released PlumIS for April 2019! Kerry Plesco - Her advice for students: Be somebody who makes everybody feel feel like a somebody. Brendan is inspired by his own children. He tries to role model for them, that if you work really hard, play by the rules and put others before yourself, good things will happen for you and those around you! 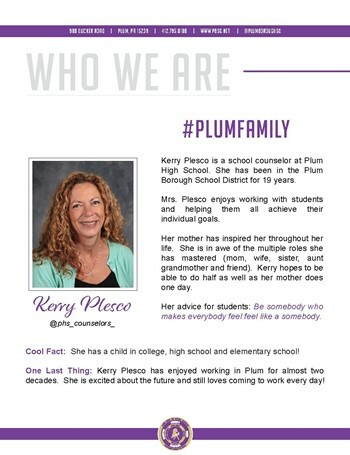 Welcome to the Plum Borough School District’s first installment of PlumIS. This interactive e-newsletter will bring you a bit closer to each of our buildings, highlighting the numerous positive stories that are happening all across the District. We are excited to bring this publication to you and hope that you enjoy reading it as much as we did creating it.